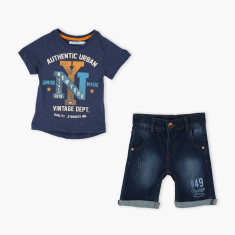 Give your child a smart look by adorning him in this t-shirt and shorts. It is made from a soft fabric that lends your child an utmost comfort and the t-shirt has an attractive print to complement the set. The button closure offers a secure fit.